Hi there. I’m Graham, and this is the first Art Department entry in the Rocket Rumble Development blog. Originally I thought I’d write my opening post about colour palettes. A bright, colourful look is an important part of our game’s identity, and hopefully something that will make it stand out from a lot of other space-themed games. Exploring that part of RR’s aesthetic is definitely worth a blog post… but... if I’m honest, when I signed on to join the project, I didn’t immediately start doodling colour schemes in my spare time. No, like any true man-child would, I started drawing spaceships. So, in the spirit of accurately reflecting the development process, today’s blog is about my first round of spaceship designs. I’ll tackle colour palettes in a future entry, so keep checking back, swatch fans. Let’s start out with a bit of context - I wasn’t part of the Small Jelly team when the project began. Rocket Rumble (or Muon, as the project was originally codenamed) started initial development in November 2015, but I didn’t actively start work at SJ until April of the following year. I had, however, seen an early prototype* of the game in February, so even before I had joined the company, I was able to start doodling ideas. I'm a big believer in form following function, and the prototype gave me a really clear idea of the role of spaceships in the game and how they would actually be seen on screen. This is always an important thing for artists to keep in mind - how will my designs actually be used? No point carefully designing something that looks really cool from the front, only to find it mostly gets seen from the back and doesn’t work from that angle. In Rocket Rumble, ships are essentially platforms for the game board. During battle, there are two ships on screen, flying alongside each other broadside-style. As illustrated by my excellent diagram below, they are viewed from a high angle, flying towards the top of the screen, facing away from the player. 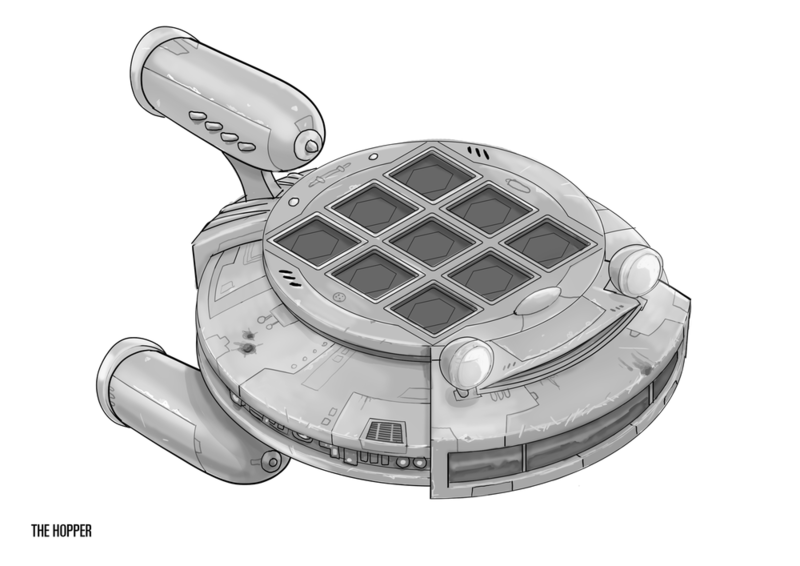 Each ship carries a 3x3 grid on its back, on which weapons and other game-pieces are placed. This is the key consideration for RR’s ship design - gameplay is centred around these grids, so the proportions of each vehicle should be biased towards giving the grids prime position on screen, making them easy to read and easy to interact with. Also, since you're ultimately trying to destroy your opponent’s ship, there should be clearly visible areas of hull around the grid for you to target. And finally, of course, it all has to look good, or no one will want to play the game. So, having distilled the function of the ships, I was ready to start thinking about their form. The first thing to do, as with any project, was research. From the get go, everyone wanted the game to be colourful and (even though there would be few, if any, actual characters in the the game) full of personality. It falls on the ship design to carry much of this. For me, the research phase never really stops, but once I’ve gathered a good cross-section of reference images, I usually can’t wait to just start drawing. Now, at this early stage, most artists will tell you the way to design vehicles (or anything really) is to do lots of fast, simple thumbnails, or rows of silhouettes.This lets you explore lots of ideas quickly and cheaply, and could perhaps throw up a few happy accidents along the way. It's a sensible approach to the initial concepting phase. But this is a blog, not a tutorial, and to be honest I don't always do what's sensible. For Rocket Rumble I just started drawing straight-ahead, relatively fleshed-out designs. I called it the Station Wagon, having taken inspiration from images of bulky old family cars with wood panelling down the side. It's not the best sketch in the world, but at this stage I’m not really thinking about making something that will be good enough for the final game. I’m exploring ideas and practising their implementation, which is a large part of what concept art is for. Here, I'm starting to think about working with the component grid, and getting a sense of the vehicles’ scale (hence the open door and passenger outlines). You’ll notice I’ve drawn the ship from a reverse angle, because most of the time the ship will be seen from the back. This leads me to spend more time researching rocket boosters and jet engines, fuelling yet more ideas. So even if this image gets immediately archived and never seen again, it's taken me through a process, started my brain tackling the practical requirements of the task. Concept art doesn’t have to be beautiful to have value. As research and sketching continued, I started going beyond the initial 50s retro look and trying out a few different styles. The justification is that we want different races/classes in the game, and each should have its own look and shape language. I also want people to have favourites, so we need to offer enough variety between ships to cater for differing tastes. I also felt it was important to see things from the camera angle that they would be viewed from in-game. Working in 3D made this really easy. I just set up a few different cameras and checked back and forth between views as I blocked out the model. I could make sure, for example, that those big engine blocks at the back didn't obscure the weapons grid.